My First Award for Blogging! Creative Blogger! 2 Comments on My First Award for Blogging! Creative Blogger! I love blogging because it gives me a sense of global community. The thought that I am connected with people all over the world feels just right! 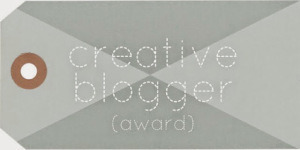 So, I am both delighted and humbled to be nominated for a Creative Blogger Award. Thanks to fightalone for paying attention to what I have written – your nomination is truly appreciated! 1. Nominate 15-20 blogs and notify the nominees. 2. Post the link of the blog that nominated you. 3. Share five random facts about yourself. I am an educator who loves learning. Blogging is my way of making human connections all over the world. I am fiercely loyal to those who allow me to be. My faith in God gets me from day to day. I love people, dogs, and cats (in that order). Congratulations. I am learning a lot from you. Next Entry Just do it!